The imagination and the rendering skills of the students so impressed Lily Yeh that she incorporated their works directly into the large mosaic floor design she created for the school campus. Dedication of the three-story high mural on corrugated metal wall on March 7, 2015. Many distinguished guests participated in the ribbon-cutting ceremony. The small Mei Hwa Elementary School, neglected and little visited, was filled with reporters, visitors, and excitement. We accomplished the ambitious project within nine days, with numerous pairs of hands, from that of kindergarteners to senior citizens, families, volunteers from local region and far away cities. We accomplished and WE CAN!!! 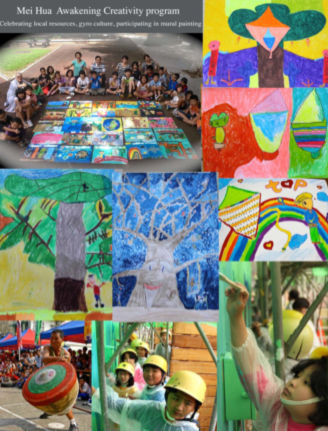 The Barefoot Artists program at Mei Hwa Elementary School aimed not only to create a beautiful mural, but more importantly, to bring change in the community, from viewing themselves as the unwanted and the weak in the society to becoming poised and creative people who take action to make things better for themselves. To do that, one must engage the children. Collaborating with Zizhuo Shi, a Buddhist nun from Xiang Guang Shan Si (香光山寺), the “Awakening Creativity in Mei Hwa” program was launched last summer, ten months before Lily’s visit. It included painting, story-telling, presentation, interviewing elders in the community and exploring forgotten historical sites in the region. (Left) The poster announcing the Awakening Creativity summer program. (Right) Look at the children. How proud they are with their art works! 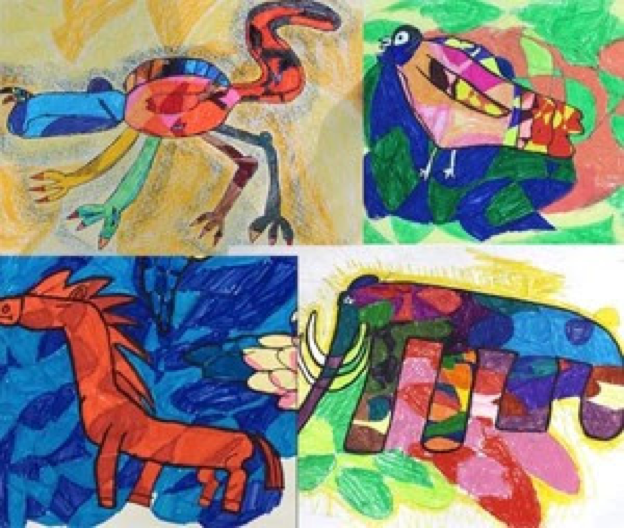 Through this on-going “Awakening Creativity”program, students created images of two themes, the gyro tops and the tree of life. 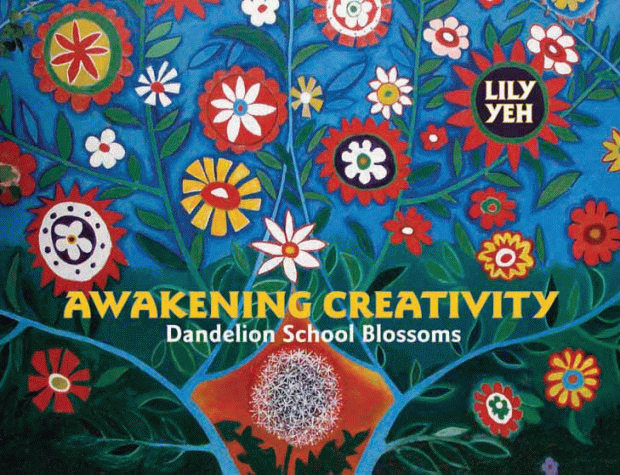 Their imagination and sensitivity guided the development of Lily’s design for the mural, which incorporated many of the images created by the students. The gyro tops in the mural represent the long tradition of gyro sport in Daxi, which used to be a flourishing port, exporting many things including the hardwood camphor trees that grow abundantly in the area. Woodcarving and furniture making once thrived. Adults turned the small leftover wood pieces into spin tops for children to play with. Over time, this popular game evolved into a special kind of sport and a gyro culture evolved in Daxi. A shining feature of the Mei Hwa School is its unique gyro sport program, in which students compete and perform with wooden spin tops of all sizes. It was created because of the passion and dedication of the national gyro master Mr. Jian-Wu Wu (吳建五) and the unusual history of the region. Mr. Wu, who has dedicated his life to the development of the gyro sport, is also a passionate educator. His creativity has turned the gyro sport into performance art. Under his gentle but firm coaching, Mei Hwa students become confident and self-assured through long hours of individual and team practices. His effort led to the building of the Gyro Top Museum, where local culture is preserved, honored, and celebrated. 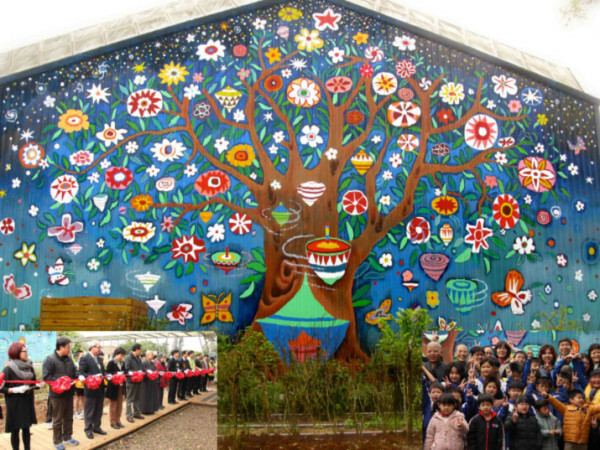 Our mural is titled the Mei Hwa Gyro Tree of Life in recognition of this culture. 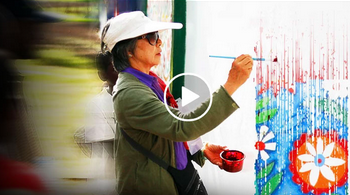 The Mei Hwa Gyro Tree of Life Mural Project was a great success despite many challenges. Execution of the project was chaotic and difficult with so many pairs of hands, from kindergarteners to retirees, from the school community to volunteers from the local Daxi region and from the cities of Taipei and Taizhong. In addition, it rained almost every day. Drizzles continually washed away our paints and smeared our surfaces. It was not easy to create, salvage, and repair from a six-level scaffolding with people coming and going in different shifts. Yet, the dedication and persistence of the many participants paid off. The whole community was moved by the scale and beauty of the mural. The project transformed people’s understanding of the power of art. It empowered the school community to envision; it emboldened the Daxi residents to dare to imagine. One of the reasons for its success is the dedication of our partners, the Gaya Foundation and Xiang Guang Shan Si (香光山寺) with its many devoted volunteers. When the school authorities and teachers doubted and wanted to withdraw from the project, they displayed courage and held steadfast to the promise of realizing a vision. Their confidence in me laid a solid foundation for the project. Lily was inspired by the commitment of these two religious organizations to live the principle of compassion in everyday life. They were realizing Buddhist teachings of generosity and kindness through working with and strengthening the vulnerable in the society. In fact, I am the one who benefits the most through the process of teaching weekly art classes and preparing the creation of mural. I read your book Awakening Creativity several times and translated some part of it for Principal Yeh. Hence, I became familiar with your educational ideas and methods of guiding students to create artwork. Also, in the preparing period, in order to invite community people, I came to Mei Hua and visited quite a few local people and made friends with them. Accordingly, I became more familiar with the situation of Mei Hua community. Furthermore, the hardship of not being supported by Principal Yeh and other people, also made me stronger than before. Particularly, when the mural is finished, it confirmed that sometimes, a great work may not be understood by everyone. I am so happy that the result turns out to be so great. More significantly, now Principal Yeh is very willing to take up the responsibility of preparing the building of a cosmic Gyro Top next year.